The trunk says a lot about Rolls-Royce’s new SUV, the Cullinan. Inspired by the good old days when “one never travelled with ones luggage,” per Rolls, there’s a glass partition between the luggage compartment and passenger compartment. So you don’t have to listen to your stuff rattling around in the back as you waft along. Rolls-Royce today is all about offering its customers the most luxury and comfort imaginable in its cars. Its method of doing so involves obsessive engineering and attention to detail. Any sort of disturbance while in a Rolls-Royce simply isn’t acceptable, even if it’s from luggage sitting in the back of the car. I think that one example sums up Rolls-Royce’s approach with the Cullinan best, but this SUV features tons of really clever engineering and thinking. The Cullinan’s most obvious rival, the Bentley Bentayga, rides on a platform shared with the Audi Q7 and Porsche Cayenne. There is no such platform sharing for the Cullinan—the platform underpinning BMW’s upcoming X7 SUV simply isn’t suitable for Rolls. Instead, it rides on a version of the all-aluminum spaceframe that debuted with the new Phantom. The 6.75-liter V12 in the Cullinan is also shared with the Phantom. 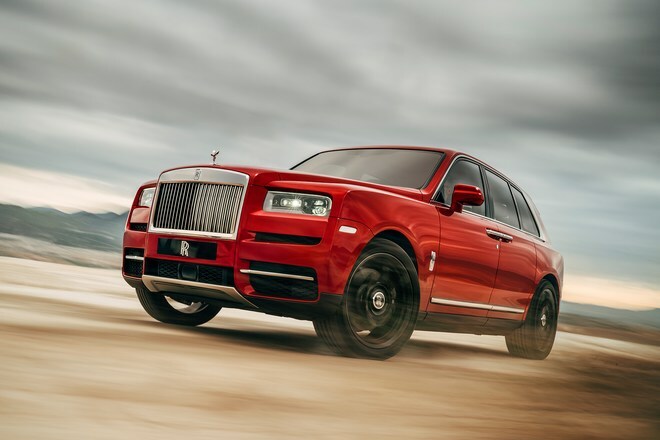 Both offer 563 horsepower, but the engine in the Cullinan is tuned to offer more low-end torque for off-roading, 627 lb-ft at 1600 rpm to be precise. And when you’re on a paved road, the V12 can propel the Cullinan to a limited 155-mph top speed. Of course, the interior is what most Cullinan customers will focus on. As you’d expect from a Roller, there’s all the leather, wood, and metal you want…and none of the plastic you don’t. There’s also a cool rear jump seat on the tailgate, shown at the top of the article, which will be surely used for watching a polo match or two. And getting inside is even a luxurious experience. The Cullinan’s suicide doors open and close automatically, and the car lowers by 40mm for easier ingress and egress. It’s easy to dismiss an ultra-luxury vehicle, especially an SUV, as being ridiculous. But it’s also easy to admire the level of engineering and thought that went into making the Cullinan. Rolls-Royce could have very easily been cynical and made a fancier BMW X7, but it didn’t. It actually put in the work to make something special.